Sony DSC-F1, the first camera of the series, released in 1996. This is a list of Sony Cyber-shot digital cameras. Sony Cyber-shot DSC-H50 (2008), with lens hood attached. Lens-style compact cameras designed exclusively for use with smartphones. DSC-RX10 (2013, 1.0" type 20-megapixel BSI-CMOS sensor with fixed zoom lens Carl Zeiss Sonnar T* 24–200mm (equivalent 35mm) F2.8 along the zoom range), BIONZ X processor as Sony α7, has 3 EV built-in ND filter, 10fps, WiFi and NFC. Capable for high video quality shoot with stepless aperture control, headphone and mic sockets, focus peaking, zebra exposure warning and uncompressed video output. The DSC-S85, released in 2001, was the first 4-megapixel consumer-level digital camera. 2007 Sony Cyber-shot DSC-T200 [Compact Sensor – 5× optical zoom – CCD – built-in flash – ISO 3200 – Carl Zeiss 3× optical zoom and the Sony Double Anti-Blur Solution, 3.5-inch touch panel LCD, 8.1 megapixels]. with point & shoot camera sales decreasing, Sony has not made a new model since 2014 and is likely to discontinue the lineup. Cameras using a CMOS Sensor, designed for faster auto-focus and low light capability. On July 7, 2010, Sony unveiled the Sony DSC-TX9 and DSC-WX5, which are the world's smallest 3D cameras and capture 3D images with a single lens system using a sweeping motion. Sony also introduced the DSC-T99 14.1 MP CCD camera for about $250. The three cameras above offer a 3D Sweep Panorama feature, which lets one take panoramic pictures in one press-and-sweep motion. The high-speed burst of frames is stitched together using innovative processing techniques to automatically create a detail-packed 3D panorama. These images can be seen in 2D or 3D on compatible 3D televisions. The cameras have been available since September 2010. In 2006, Sony Mobile Communications then known as Sony Ericsson Mobile Communications (a former mobile communications joint venture between Sony and Ericsson) launched a mobile phone using the Cyber-shot branding for the Sony Ericsson K800i, featuring a 3.2-megapixel Cyber-shot digital camera and a xenon flash. On February 6, 2007, Sony Ericsson announced the K810 Cyber-shot phone. Building on the success of the K800, the K810 adds a number of features that make its 3.2-megapixel autofocus camera even more camera-like. Sony Ericsson also expanded its Cyber-shot branding to a mid-range handset, the K550, which has a 2.0-megapixel camera bundled with autofocus and LED flash. Sony Ericsson announced its flagship K850 on June 14, 2007 and its Candy-bar K770 on February 3, 2008. In Japan, Sony Ericsson used the Cyber-shot name on the SO905iCS, 'CS' standing for Cyber-shot. The handset featured an Exmor CMOS sensor, as well as a smile shutter, BRAVIA Screen and a 3x optical zoom mechanism. As a successor to the popular K Series, Sony Ericsson introduced the 'C' Series. The initial handset released under this category was the 5-megapixel C902, with the C905 announced shortly thereafter. The C905 signalled Sony Ericsson's entry into the 8-megapixel camera phone market. After Sony's mobile division ceased to be a joint venture in 2012, all production of new Cyber-shot phones have currently stopped. ^ Digital Still Camera: Operating Instructions, DSC-F1. Sony Corporation. 1996. p. 55. ^ Sony Electronics, Inc. "Sony eSupport - DSC-F828 - Support". Retrieved 10 May 2015. ^ "Sony DSC-P20". Retrieved 10 May 2015. ^ "Amazon.com : Sony DSCP71 Cyber-shot 3MP Digital Camera w/ 3x Optical Zoom : Point And Shoot Digital Cameras : Camera & Photo". Retrieved 10 May 2015. ^ "Amazon.com : Sony DSCP72 Cyber-shot 3.2MP Digital Camera w/ 3x Optical Zoom : Point And Shoot Digital Cameras : Camera & Photo". Retrieved 10 May 2015. ^ R Butler. "Sony Cyber-shot DSC RX10 First Impressions Review". Retrieved January 19, 2014. ^ "Sony Cyber-shot DSC-RX10 II". DPReview. Retrieved September 14, 2017. 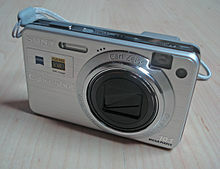 ^ "Sony Cyber-shot DSC-S80". dpreview.com. Retrieved 10 May 2015. ^ "Sony DSC-T700 review". DigitalVersus.com. September 2008. Retrieved 2008-09-16. ^ "Support for Sony product - Technical Support". Retrieved 10 May 2015. ^ "Consumer Electronics - Sony US". store.sony.com. Retrieved 7 April 2018. ^ Phil Askey (July 2003). "Sony Cybershot DSC-V1 Review". Digital Photography Review. Retrieved 2008-02-08. ^ Phil Askey (December 2004). "Sony Cybershot DSC-V3 Review". Digital Photography Review. Retrieved 2008-02-08. ^ "Sony DSC-W30 Review". Retrieved 10 May 2015. ^ "DSC-W40 Specifications - Sony UK". www.sony.co.uk. Retrieved 7 April 2018. ^ "DSC-W180" (PDF). sony.com. Retrieved 7 April 2018. ^ "Sony DSC-W300 review". DigitalVersus.com. September 2008. Retrieved 2008-09-16. ^ Sandra Vogel (5 February 2011). "Trusted Reviews". Retrieved 10 May 2015. This page was last edited on 8 April 2019, at 00:56 (UTC).